The triennial U.S. Geological Survey Open House — being held today and tomorrow (5/20) in Menlo Park — is a little shop of wonders, not horrors. While most of the exhibit booths are decidedly geeky, each is staffed by scientists eager to pass on their knowledge about earthquakes, water quality, volcanoes, coastal and marine geology, mineral and energy resources, geography and the San Francisco Bay ecosystem. Sharing space with the USGS scientists are a number of local non-profit organizations (as well as some commercial enterprises). 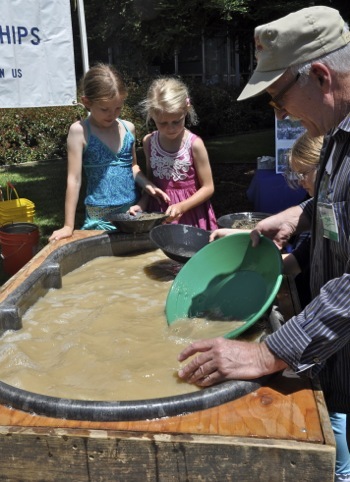 Panning for gold, presented by the Silicon Valley Gold Prospectors, is always a popular stop at the Open House. The youngsters taking part quickly learn that patience and a keen eye are necessary tools for successful prospecting. Another big draw is the appearance of the bald eagle Sequoia, brought down to the Peninsula by the San Francisco Zoo. Shot when she was four-months-old, the bullets damaged one of her toes and partially paralyzed her tail, so she is unable to live in the wild. She serves as the animal ambassador for the Zoo’s educational and conservation programs. Held on a zoo keeper’s arm, she’s offers an amazing unclose and personal encounter with one very regal bird. Throughout the day there is a series of presentations, often a mix of video and live talk, on topics that showcase the USGS’s work. Those attending also get the chance to see the second largest public collection of rhododendron varieties in the California and listen to live music, including the USGS’s very own house band, Duckweed, which plays old-timey tunes as well as Irish jigs, reels and ballads. 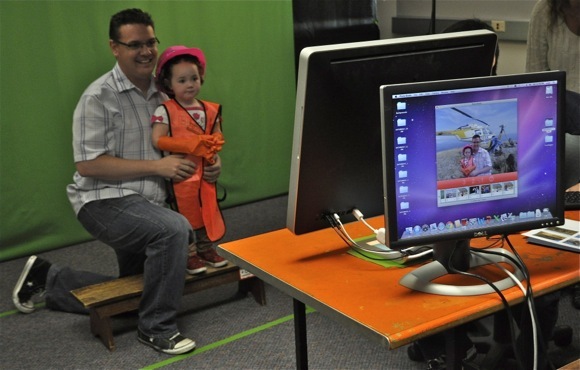 And both kids and their parents get to enjoy the chance to “dress like a scientist” where they stand in front of a green screen and are photographed in the setting of their choice, thanks to a bit of computer magic. 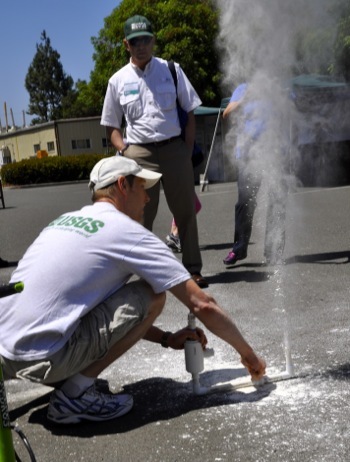 The USGS open house, which is free to the public — another decided benefit, continues today until 4:00 pm and resumes tomorrow from 10:00 am to 4:00 pm. It’s a great opportunity to get acquainted with one of Menlo Park’s largely hidden jewels located at 345 Middlefield Rd — even if it’s all about rocks!